This 1.75 bowl undermount sink from BLANCO is made of 80% natural granite. 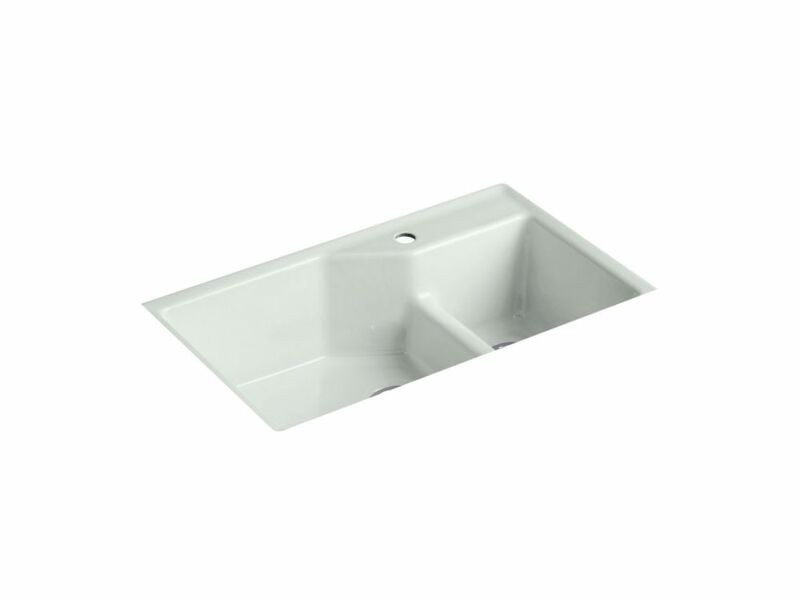 Features a low divide between bowls, while the centre-positioned drain hole design provides a reversible solution; large bowl can be located on left or right side. The enormous main bowl accommodates bulky items. 3-1/2 inch stainless steel strainers are included. The understated beauty of this Riverby sink makes it an elegant and versatile addition to the kitchen. A single, large bowl provides ample space to soak and wash cookware, while a sloped base to a single offset drain minimizes water pooling. Crafted from enameled cast iron, this sink resists chipping, cracking, or burning for years of beauty and reliable performance. It comes with a custom-fit colander with integral cutting board, a utility rack with soaking cup, and a left-hand, stainless-steel bottom sink rack. This Strive kitchen sink offers professional style with easy-to-clean curved corners. Made of thick, premium quality 16-gauge stainless steel, the unique extra-large offset bowls maximize cabinet space, making room for your largest bakeware and cookware. Strive features a sound-absorption system that significantly reduces disposal and dishwashing noise. This sink includes a divider dishcloth bar, a divider utility shelf for scrubbers and sponges, and a bottom sink rack to help prevent scratches. Indio Smart Divide Undermount Cast Iron 33 Inch 1-Hole Double Bowl Kitchen Sink In Sea Salt Add a modern vibe to the kitchen with the crisp design of Indio. The large/medium bowls allow you to keep clean and dirty dishes separate while offering plenty of room for oversize pots and pans. Crafted from enameled cast iron, this sink resists chipping, cracking, or burning for years of beauty and reliable performance. Two bottom sink racks, a colander, and a walnut cutting board are included to fit the sink perfectly and simplify the cooking process.